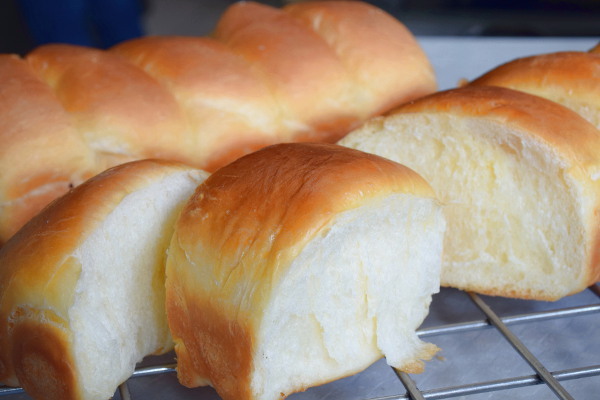 In this post, I will show you the softest, lightest and fluffiest Japanese milk bread recipe. You may wonder, Japan is not the country famous for bread, so what is so unique about the Japanese bread recipe? TangZhong is the term of the semi-cooked flour/water mix when it is heated up to 165°F/74°C, which resembles a pudding-like roux. 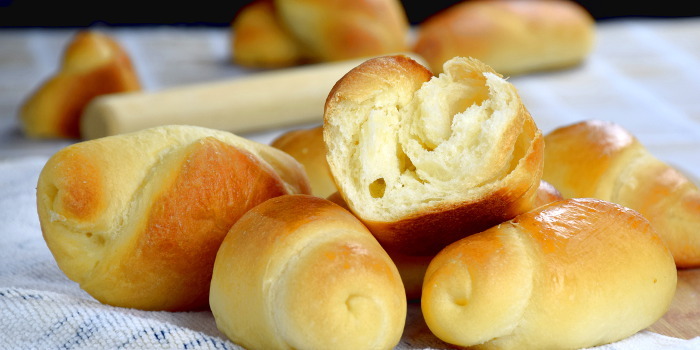 The gelatinized starch withhold more moisture, which makes the bread incredibly soft and fluffy. This method is not something familiar to people who grow up in the west, where bread is the staple food. In fact, archaeology and history show that bread has been eaten since at least 30,000 years ago, according to an article. There is extensive evidence of breadmaking in Ancient Egypt and the Middle East long ago. Fast forward to the present time, the method of bread making has been improvised in different ways all over the world. Bread is something undeniably tasty. The flavor of a good loaf, the cracking sound of biting into a freshly baked baguette, and the texture of the soft crumb is almost a sensual experience. But in the Far East at Hokkaido, Japan, at the land of the rising sun, people living there are making bread with a soft, tender and silky smooth texture, taking the position at the other end of the spectrum. 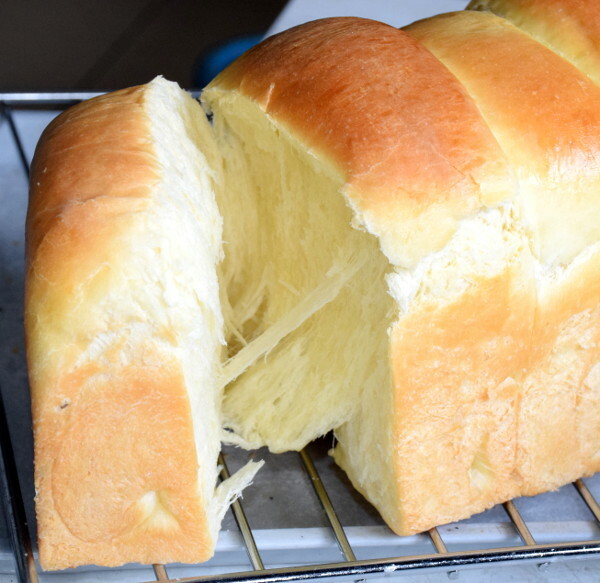 Japanese or Hokkaido milk bread has become the typical stable in Japan, It is as light as a feather and can tear apart like cotton when it is fresh from the oven. It is a big contrast to hard crusted, razor-sharp crusty hard rolls that can slice up your tongue. Read on if you are willing to stick your neck out trying something unconventional. Making Japanese soft bread can be messy, and it takes time to master. Therefore, I try to strip off the unnecessary information, making it simple and straightforward. As you will notice in the video, I use a simple, small mixer for demonstration rather than using my large mixer in my cafe. The method is virtually hands-free except shaping the dough. Alternatively, make use of your bread machine if you have one. This is the most important step in baking Japanese milk bread that is as soft as cotton. Mix one part of bread flour with five parts of water. Place the flour/water mixture in a small pan (I use a milk pan), heat it up slowly over low heat. The slurry will start to become thicker as the temperature rise. Eventually, you can draw lines while stirring, similar to the consistency of whipping cream just before it forms soft peaks. At this time, it should be around 65°C/150°F. (You can use a kitchen thermometer to test it, but after a few practice, you should be able to judge it visually to decide when to remove it from heat. Let the TangZhong cool down before adding to the dough. Look at the paper-like texture when you tear open the bread! Scaling the ingredients are quite straightforward. The only thing might be a little tricky is how much water is required. My favorite amount of water is 63ml per 100g of flour. This ratio usually yields bread dough that is moist, elastic but not too wet to handle by hand. Flour has the most significant effect on the outcome of bread among all the ingredients. You need to use bread flour, not the cake flour in this recipe. Bread flour has 12% to 14% protein (gluten), which can produce bread with good structure and texture. The recipe is set up with the weight of flour as 100%, and the amount of other ingredients is relative to flour. I will not follow exactly the textbook method, but with a few twists to bypass some kinks and quirks along the way. Bread flour contains 12% to 14% gluten, which is an essential ingredient for good bread structure. Gluten is the composite of the protein called glutenin and gliadin. When flour meets water, glutenin will denature and forms a long, curly string. This string gives the bread the desired structure, allow the dough to expand and rise. Glutenin is hydrophilic (meaning attract water) and able to hold more water in the structure of the bread. Therefore, glutenin contributes to the elasticity and springy property of the dough. Gliadin is hydrophobic (water repelling) and therefore counteract the elasticity of gluten and contributes to extensibility to the dough. Bread flour has the percentage of gluten that provides the optimum amount of gluten for bread making. Japanese bread is soft like cotton and with a fine texture. Mixing is self-explanatory, but there are some key points worth to take note to obtain the best result. Incorporate the flour and water and set aside to let it rest. This step is called autolyze, which is a passive step to develop gluten. You can skip this step, but autolyzing the flour will produce loaves of bread with better structure. If you are using active dry yeast, mix it with water to bloom it before adding to the floor and water. Mix with a dough hook at low speed. If you use a small mixer, start with low speed as it might be damaged if you are mixing a tough dough. Low speed is preferred as high speed might tear apart the gluten. Mix all the remaining ingredients (except butter) in the recipe for eight to ten minutes. You will notice the sticky mess in the mixer slowly bind together and takes shape. Add the butter at the last stage since butter hinders gluten development. 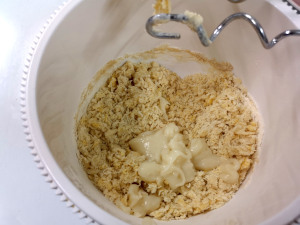 After a while (about mixing for eight to ten minutes, depends on the power and the speed of the mixer) the sticky mass will become a sticky dough, and eventually turns into an elastic dough with a shiny surface. Perform a stretch test. Mix the dough until you can stretch the dough to form a semi-translucent film without breaking it. This method is commonly used to determine whether the mixing is sufficient. At this stage, you can stop mixing and proceed to the next step. 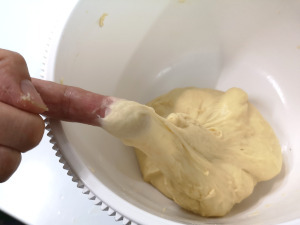 After mixing, leave the dough aside and wait for it to expand. The expansion is due to the yeast cells consume the sugar (which is the result of the starch breaks down during fermentation) and start to produce gas and alcohol. (Yes! The yeast cells can eat, fart and poop!). It is best to cover the dough with a kitchen towel or cling film to prevent a crust from forming. Let the dough rise to the room temperature. Do not rush the bulk fermentation. In fact, slow rice is better because it encourages flavor and structure development. Fermentation is completed when the dough is double in size. If you poke your finger into the dough at this stage, a dent will remain. So far your hands are clean because the mixer is doing all the hard work for you. Now it is time to get your hands dirty. This is a step you cannot rely on the machine. Use your fist to punch down the dough (lightly of course!). Punching helps to release the air trapped in the dough. Lift up the side of the dough with a floured hand, and it should flop out in one giant blob onto the table. It is now much less sticky (and more elastic) thanks to the formation of gluten. Use a baker’s scale, portion the dough and divide it into pieces of uniform weight with a dough spatula. Remember there will be about ten to thirteen percent water loss during baking, so the bread/bun will become lighter than the pre-baked dough. So let’s say you want to make some rolls weighted 50g each, you should weight 60 g of dough to get the desired weight. Shape each portion into smooth, round balls. This procedure is called rounding, which stretches the gluten to form a skin on the surface. It helps to shape the dough and also retain gases produced by the yeast cells. 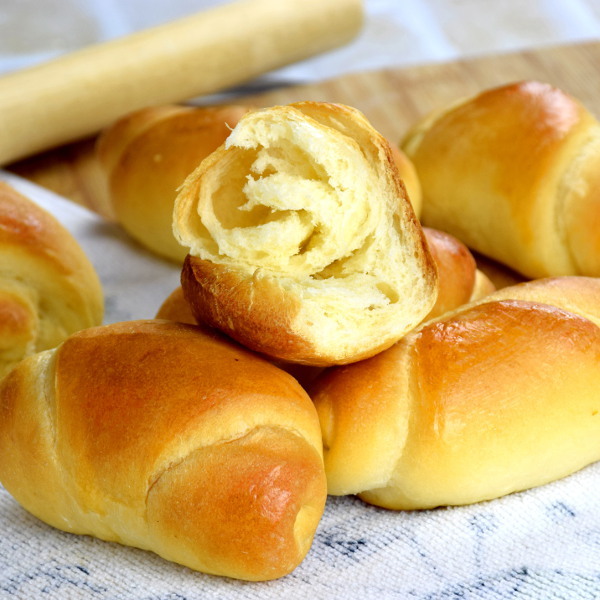 Folding is a crucial step to making Japanese milk bread, although it does not apply to many continental bread recipes.Folding the dough like making croissants help to form texture with layers. You can peel off the bread by layers as thin as paper by hand.Add this little trick to your bread making routine. You will be amazed by the paper-like texture.Roll out the dough with a rolling pin into a rectangle, as thin as possible but not to break it. After that, roll it up like making a Swiss roll. Clean up your working surface with the bench scraper. Japanese soft buns are perfect for breakfast or afternoon tea. After putting the shaped dough in the loaf pan or baking pan, cover it with a damp cloth to retain moisture. You can leave them in a warm place until it doubles in bulk. You may also place it in a cold area and let it proof for a longer time (also called retarding). Slow proofing will give the bread better flavor. If you have a rich dough (as in this formula, in which there is a high content of butter), you may want to under proofed slightly as the weaker structure of gluten (as a result of the higher amount of oil) with not withstand much stretching. Bake at 180°C/350°F for 25 minutes or until the crust turns golden brown. Be careful so not over baked the rolls as we are making Japanese soft bread, not a crusty finishing like banquettes. Perhaps the most noticeable change during baking is the size of the dough. So if you bake the dough which has doubled its bulk, the final volume of the bread will be more than double, around 2 1/2 times larger than the original size. The volume expansion is due to the last effort of the faithful yeast cells before they eventually surrender their life as a result of the increased heat in the oven. This process is called oven spring. 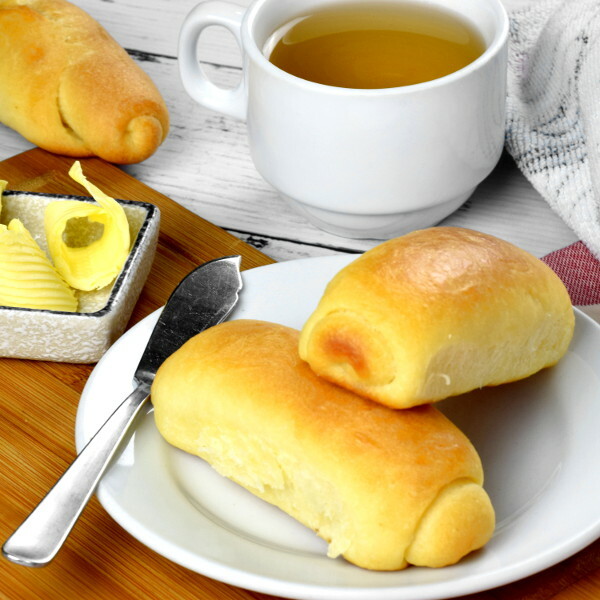 Oven spring occurs due to the rapid rising of temperature in resulting rapid expansion of the gas trapped in the dough and the increased activity by the yeast at a higher temperature. However, once the temperature reaches 60°C/140°F, yeast will be killed, and the dough will stop rising. Another significant change is the browning of the surface, producing the unique flavor of the bread. At this stage, the starch is broken down into simple sugar, and the proteins are torn apart into amino acids. These simple sugars and amino acids interact with each other to form thousands of organic component which collectively stimulate our senses. That is why you are attracted by the aroma drifting from the kitchen to your dining room. In chemistry, this happening in the oven is called the Maillard reaction. After baking, remove the Japanese milk bread from the pans quickly to allow the moisture and alcohol to escape quickly. Apply some melted butter before cooling if you prefer to have a soft crust on the bread. The amount of water is way too little if it is the only source of liquid. That is why you may find that is is too dry in the beginning. However, after adding the egg and the TangZhong, which have a high percentage of water, the total amount of water becomes just right. 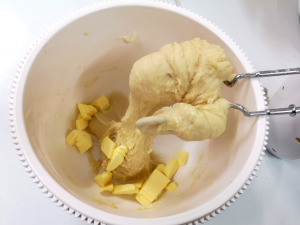 More water is added from the butter at the final stage ( butter contains about 16% of water), which make the final dough has the right consistency. The buns are just baked and cooling on the rack. Japanese milk bread is the fluffiest, softest bread you can find. Mix the bread flour and water in part 1) in a small pan, heat it up slowly over low heat. When the slurry starts to become thicker, you can draw lines while stirring it. When this happens, remove it from heat. Mix the water and flour in part 2 together, mix it for half a minute and set aside to autolyze for at least half an hour. Add the TangZhog and rest of the ingredients in part 2 (except butter) into the flour/water mixture. Mix with a dough hook for eight to ten minutes. Add butter and mix for another two minutes or until you can stretch the dough to form a semi-translucent film without breaking it. Cover the dough with a kitchen towel or cling film. Let the dough ferment at room temperature until it doubles in size. If you poke your finger into the dough at this stage, a dent will remain. Punch down the dough. Place the dough on a working surface. Portion the dough and divide it into pieces of uniform weight. Shape each portion into smooth, round balls. Let the dough rest on the working surface for ten minutes to let the gluten relax. Roll out the dough as thin as possible, and then roll it up like making the Swiss roll. Place them in an oiled bread pan. Cover it with a damp cloth or cling wrap to retain moisture. Leave them in a warm place until it doubles in bulk. Apply some egg wash on the surface. Bake at 180°C/350°F for 25 minutes or until the crust turns golden brown. 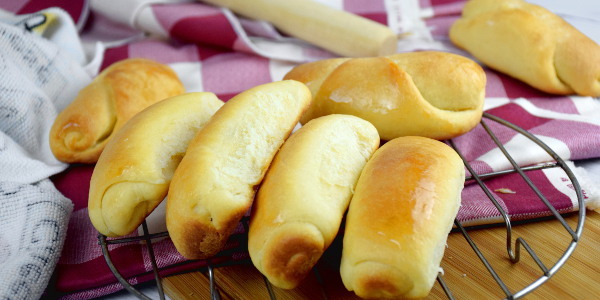 This Japanese milk bread is the softest, lightest and fluffiest bread ever. The following example demonstrates how to convert any bread recipe to the pillowy soft Japanese milk bread. 1. Set aside 5% (5g) of the bread flour in the recipe to prepare the TangZhong. 2. Reduce 5g of flour in the recipe. 42 replies to "Japanese milk bread- How to make the softest, lightest and fluffiest bread ever"
Thanks Sifu for so generously sharing your recipes and teaching us. For the Japanese bread, can we use instant yeast instead of active dry yeast? If not, then any recommendation of brand for the active dry yeast sold locally here? Yes, you can. Any form of yeast will give you the same result. You may just get a small packet or those in a small plastic container from the local supermarket. hi, 55ml water for 250g flour doesn’t seem right. Please help. I want to do more so i’m doubling all ingredients. But 500g flour with 110ml is very dry. I have just verified the recipe this morning before I answer your question to ensure it is correct. The amount of water is way too little if it is the only source of liquid. That is why you find that is is too dry. However, after adding egg and the TangZhong, in which both have a high percentage of water, the total amount of water becomes sufficient. You can take a look of the images I just added, right above the video in the article. Thank you so much for your question. You let me have a chance to pick up this confusion and amend in the post. Great to know that you are looking for this recipe which I have just uploaded, Do try out the Japanese milk bread and enjoy it. It was the best Hokkaido milk bread I made. Following your instructions step by step. Thanks for sharing . Thank you for following this Hokkaido milk bread recipe. Glad to know that it works. Can i substitute milk powder with milk for this recipe and how do i adjust the overall liquid content if i do? We don’t consume milk powder at home so it would be a waste to buy a whole tin just for a few grams in the recipe. Thank you KP Kwan for sharing your recipie with us. I have yet to try but I wld appreciate so kuch if you can give measurements in cups & spoons. My weighing machine is not accurate. Wld love to try it ASAP. It is tough to convert into cups and spoons, each ingredient and has a different weight when they are filled into the cup. My best suggestion is to buy a reliable kitchen scale that can measure to the accuracy of one gram. Can you do this with English Muffins, or would that turn out awful. I have not tried that so far, and neither good at English Muffins. Sorry that I cannot really give you a good recommendation. If I wanted to make a loaf of bread instead of rolls, would i need to double the recipe? I all depend on how large is the pan. Take into consideration that you need to wait until the size of the dough doubles before baking, and it will likely expand further in the oven. Other than that, bake a little longer (same temperature). Thank you for your suggestion. I will use cups and teaspoon etc. for baking items in future so that it is easier to follow. Please continue to keep your recipes in the metric system, i.e., grams, milliletters, etc. The recipes are more accurate when weighed. PASTRY Chefs and most other chefs always weigh the ingredients for accuracy- especially baking Please do not use the stupid and unreliable cus, spoons ounces, pounds and other inaccurate measuring devices. Scales are the best. All my family recipes need a scale in order to make them – they also use metric weights to accuracy. Love your recipes just the way the are – please keep them like they are. Lazy people use cups and spoons when baking & cooking because it is easier. We love the Hokkaido Bread! Thanks for sharing your recipes. Most ignorant people will not share recipes. I don’t know what they think they!!!!! Thanks again Bobby. Thank you for your support to continue use weight as the unit of measurement for my recipes. I have several inquiries to ask me converting the measurement of baking items to cups etc. I can understand that it is more convenient for them, or they do not have a digital scale at home. I know that many cookbooks use cups, spoons etc., but baking is more of science than art, and accuracy is critical to the success. I have converted all our recipes in my restaurant which I have worked for 15 years. Measurement of butter, water, milk, and even ground spices are all down to one gram accuracy. It is a proven method that all my staffs are able to replicate with high accuracy. So I am planning to use both measurements in future, grammage in the recipes and a conversion table for anyone who wants to use cups, albeit that is not ideal. Japanese bread flour is just bread flour that made in Japan. Use the regular bread flour will do. It has about the same gluten content as the regular bread flour. I use it because this is a Japanese recipe, but the difference is insignificant. The Japanese one is very fine, and the result of the bread is smoother. Dear KP Kwan, what is happening when I poke my fingers but the dent is not remained? And the dough has been doubled in size. As long as it doubles in size, go ahead for the next step. The milk bread dough is ready. Thanks for the recipe, explanations and tips. Very helpful. Can the butter be substituted with oil and how much? Would using oil, eg, olive oil be healthier than using butter? Thanks! The flavor of butter is better than olive oil if you want it to be authentic. You can substitute it with olive oil with the same amount. Olive oil is used to make many types of bread so it is alright. Dear KP Kwan, may I skip the process of tangzhong method and just use dried yeast instead? For the above recipe how much of yeast should I use? Thanks. You can use the same amount of yeast for the Japanese milk bread. If you do not intend to make the tangzhong, please add the amount of all the ingredients of the tangzhong (include water) to the main dough. The difference of not having the tangzhong is that the texture will not be as soft and stretchy. Is it ok to use hands to mix instead of a mixer and just use bread flour to flour the board if needed? It is alright to use hand to mix, provided it is a small batch. 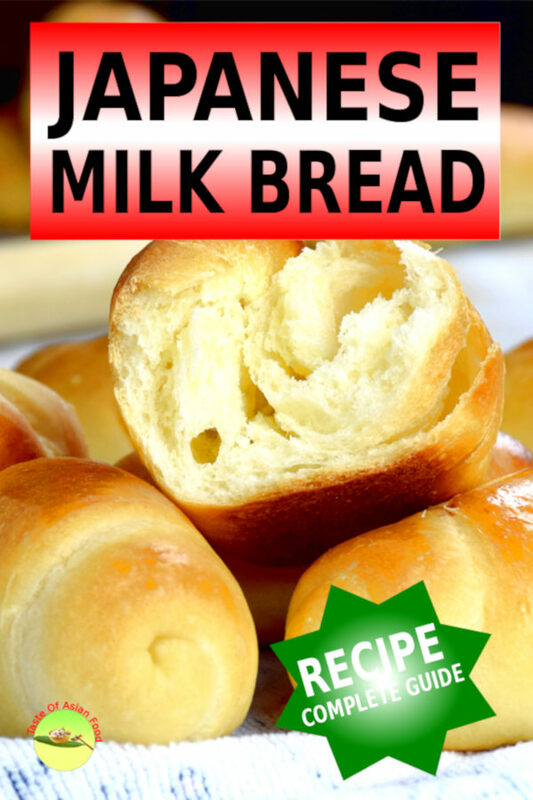 You will be very tired if you mix with hand for a large batch of milk bread. 1. I could not find a link to the video. Could you post it pls? 2. Above in the post you mention your favorite ratio of water/flour is 63ml water per 100g of flour. Doesn’t this apply to this recipe? 3. Lastly you mention 50g egg, you mean beat the egg before so if cutting out some, it’s homogeneous? 1. The video is located right above the recipe. Click the video and it will play right away. 2. I make other bread based on this 63% ratio. However, this Japanese bread has less liquid to flour ration, as it is made with the ThangZhong. Also, you can use the 63% ratio for most of the loaves, as it will form following the shape of your bread tin. The problem of making small buns by using too much liquid (water, egg, milk etc) is that is will not able to maintain the shape nicely. You can follow the amount in the recipe and it should be fine. 3. The 50g of the egg is after cracking (weight without the shell). I use a kitchen digital scale so I prefer weight everything with it, which is more accurate. Thanks and hope you will enjoy the Japanese milk bread. I check the video which is now playing correctly. I also add a Youtube link right above the embedded video. If you still have difficulty in viewing it, please click the word “clicking this link” in blue. It will open up the video on Youtube. good recipe, but you might want to get your facts straight before claiming bread ‘originated’ from the west. it’s already been proven that the first breads have African/Middle Eastern roots. Thank you for highlighting the incorrect facts in the article. I have made some changes and remove the ‘originated’ error.